I can see all the GedMatch submissions that match any submitted kit–not just tests that match my submission. I can see what amounts of shared DNA that kit has with other kits–not just how much is shared with my kit. Remember: not all descendants of a given set of third great-grandparents will be DNA matches for each other. It can be helpful to see someone else’s matches. I can see the shared matches between two other GedMatch submissions–not just shared matches where one of the kits is my own. 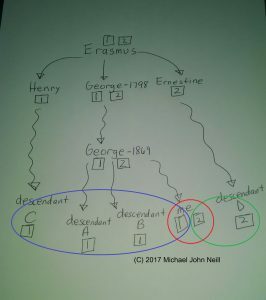 There are two descendants of one of my sets of great-great-grandparents who have submitted to GedMatch. Their shared matches could help me in my research–and those matches may not match me. GedMatch has features that are free to use, including the ones mentioned above. There are other fee-based functionalities of the system that are available for a nominal fee.